American luxury watchmaker Fossil has entered the wearable market in India, bringing in the Misfit Shine 2 and Ray, and its Q line-up of smartwatches among other products. Both the Misfit products are capable of automatically tracking steps, distance, calories, and sleep. They can also provide alerts for calls and messages, and come with a smart button equipped for home automation. To add to that, the wearables are swimproof – unlike most Fitbit devices – though they lack a display entirely. That does mean the battery can last for up to 6 months, though. The major caveat for some could be that the Shine 2 originally launched back in October 2015 and the Ray was announced in January 2016. Pricing wise, you’re looking at Rs. 7,495 for the cheapest version of the two. Shine 2 is available in Carbon Black and Rose Gold colour variants, and the Ray comes in Carbon Black, Rose Gold, Navy, Forest, Stainless Steel, and Stainless Steel Gold with either a sport or leather band. As for Fossil’s own Q line-up, there are two options: the Q Wander and the Q Marshal. Both are IP67 water resistant, offer interchangeable straps (leather or metal) and are powered by Android Wear, and hence offer the same functionality. You can respond to messages using the screen, and even listen to music or receive navigation alerts using the built-in microphone and speaker. Fossil promises a battery life of 24 hours, based on usage, and you can get 80 percent charge in less than 2 hours. The two smartwatches are priced between Rs. 21,995 to Rs. 22,595. They went up for pre-order in India last week. 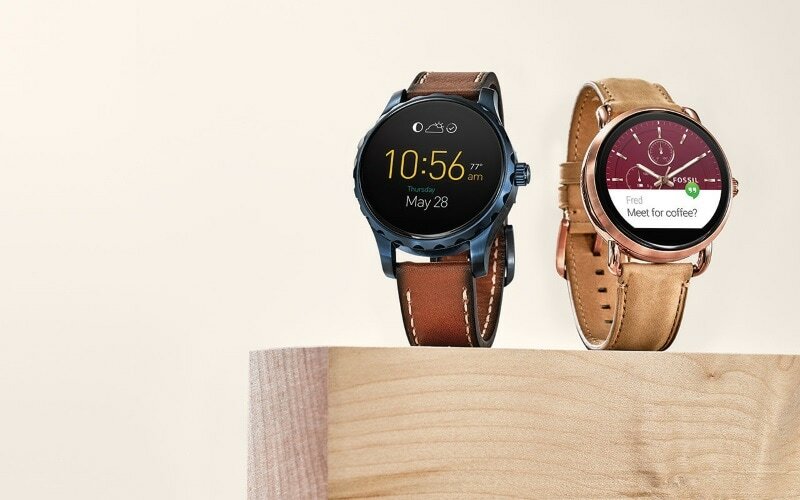 The other products Fossil announced at the event include smartwatches with the brand name of Michael Kors, Skagen, Emporio Armani, and Chaps – all of which have been licensed by Fossil. Michael Kors Access, as it is known, comes in two variants called Bradshaw Access and Dylan Access. They run Android Wear, provide activity tracking, voice activation, water resistance, wireless charging and a number of strap options – from silicone to rose gold tone. Depending on what you pick, they will run from Rs. 25,995 to Rs. 29,495. The Skagen lineup contains the Hagen Connected hybrid smartwatch and a Skagen Connected activity tracker. Since Hagen Connected doesn’t run on Android Wear, it can provide a battery of 4-6 months, while still offering “filtered email and text notifications”. Pricing is between Rs. 14,295 and Rs. 15,495. The Emporio Armani Connected wearables also fall in the hybrid smartwatch category, and will be available in Rose Gold, Black, Gunmetal, and Stainless Steel metal finish, and are complimented by either a three-link bracelet or a leather strap. They will cost from Rs. 17,495 to Rs. 27,995. Rounding up the lot is the Chaps hybrid smartwatch, from Rs. 9,995 to Rs. 10,495. Fossil says that you can expect “all the functionality of a world class tracker with notifications, hidden in the beauty of a traditional watch”. Fossil is investing heavily in the country because it believes India is the fastest growing market in Asia Pacific, and that smartwatches will constitute 40 percent of wearable market by end of this year, Jack Quinlan, APAC senior vice president of Fossil Group, said in a statement. Sonny Vu, president and CTO for Fossil Group’s Connected Devices division, added that he believes Indians are “quick to adopt the latest” in the world of technology. That, in combination with an Indian population that is relatively young – 56 percent of 1.2 billion people are aged 30 or under – has convinced Fossil that its push in the wearable market will come good.